For the past two weeks, Joe and I have been exploring the world of citrus cordials by mixing various gimlets. In Running the Gimlet Part I we made a lemon cordial, and in part II we made a lime cordial. For part III of this series, we played with a grapefruit cordial. Add peels, juice, and sugar to a pot over medium heat. Heat and stir until the sugar integrates with the juice and strain. It’s OK to be a little bit lazy with the piths when making grapefruit cordials, since grapefruit is rather bitter anyway. 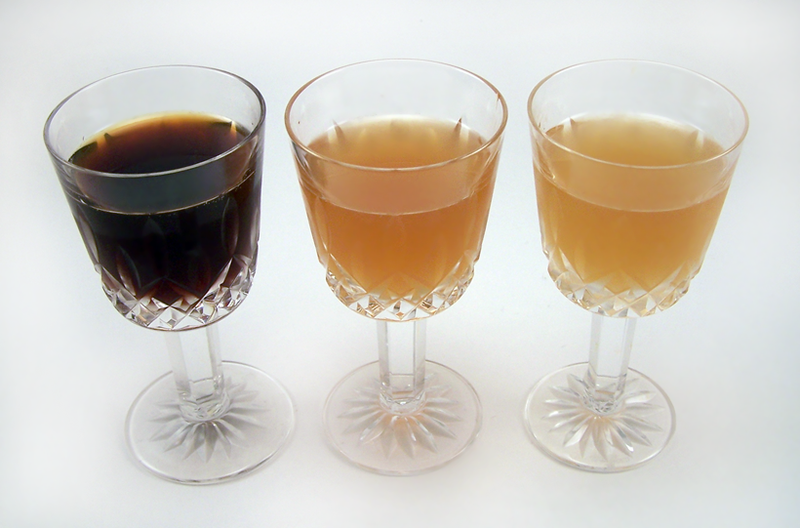 From left to right, bottom to top, we have: scotch (snifter), bourbon (rocks glass), mezcal (coupe glass), tequila reposado (martini glass), and rum (cocktail goblet). Eye: A warm, rust-colored brown. Sip: Smokey scotch, a bite of grapefruit. Finish: Scotch and grapefruit balanced each other well. This combination was the clear winner of the night. Tart citrus and scotch is a great combination, as we knew from the blood and oak. The scotch we used was Longrow 10, which isn’t very smokey or savory, because we wanted to avoid adding those sorts of flavors to grapefruit. I didn’t expect this gimlet to steal the show, but it did. Nose: Spice and citrus fruit. Sip: Oaky spice from the bourbon, sour, sweet grapefruit. I’ve always enjoyed making whiskey sours with grapefruit juice, so I knew this combination was going to be tasty. Just go ahead and make this one. You’ll thank us. I think this was probably my second favorite grapefruit gimlet. Nose: Cactus, smoke, sweet citrus. I love mezcal, so I had high expectations for this drink, but I was let down. In our past gimlet experiments, mezcal had paired well with lemon and lime, so why not grapefruit? Well, it turns out that this was the weakest pairing we came up with for grapefruit. In this drink, mezcal and grapefruit did not do each other any favors, and the two flavors fought each other in the glass. I was throughly disappointed. Eye: Pinkish yellow, like a sunset. Once again, I had high hopes for tequila and grapefruit, as we’ve mixed the two together before, in the strawberry paloma. Although this gimlet was better than its mezcal cousin, it just didn’t blow me away. Somehow the two flavors didn’t harmonize the way we had expected them to. I don’t think I’d make this gimlet again. Finish: Sweet notes from the rum, bitter notes from the grapefruit. This gimlet was excellent. We’ve paired grapefruit and rum before, so we kind of knew this was going to be awesome. We used Doorly’s rum, and the grapefruit cordial complemented its fruity, citrus flavors very well. It was hard to stop drinking this one, but it still didn’t gel as well as the scotch or bourbon gimlets. I wonder if you are as tired of gimlets as we are! Categories: classics, spirituality | Tags: alcohol, bartending, booze, bourbon, cocktail, cocktails, cordial, craft cocktails, doorly's, drinking, drinks, gimlet, grapefruit, grapefruit cordial, libation laboratory, liquor, longrow 10, mezcal, mixed drinks, reposado, rum, scotch, tequila, tequila reposado | Permalink. Joe and I made a variety of citrus cordials, and mixed up some gimlets, trying out various base spirits with each sort of cordial. In this series, we present our tasting notes. Part II brings us to the lime cordial, which was so tasty that we went a little nuts and made six different gimlets! Peels of 8 limes, piths removed. A word of advice when making a lime cordial: You need to remove as much of that lime pith as you can. Lime pith is very bitter, and can ruin your cordial. Lime cordials are a huge pain to make, but the payoff is worth it, I promise. Eye: A slightly yellow clear, with a ghastly green glow. Sip: Smokey cactus, sweet lime. The mezcal gimlet was excellent, probably one of my favorites out of the six that we made. Lime and mezcal really go well together, and the cordial mixes very well with mezcal, indeed. I love the depth that the mezcal’s smoke adds to such a simple drink. Eye: A deep yellow, almost amber. Sip: Bitter, herbal, dry, crisp. Finish: Dry, suze is pronounced in the finish. Suze is a gentian-based liqueur, and as such it tastes very bitter. Honestly, this would make a decent apéritif, as it is slightly sweet, but mostly bitter and dry. Perhaps Suze has an acquired taste, but it is one that is well worth acquiring. This was in the top three, for sure. Eye: Clear, with a hint of green glow. Sip: Gin is present in the sip. Finish: The lime cordial balances out the finish. Of course we had to make a gin gimlet. A word of advice: the gimlet is a simple cocktail, and as such, it emphasizes the base spirit, so don’t skimp out and use the cheap stuff, go for your favorite gin, as the gimlet is a brilliant way to showcase it. I’m not sure I need to say much about this gimlet, since we’ve all probably had it a million times. If not, definitely make sure you try one soon. Finish: Fernet Branca, lime detectable in the finish. Drinking lime juice and Fernet Branca is a delicious experience, and so Joe and I had high hopes for mixing Fernet with our lime cordial. It worked out about as well as Fernet and lime, which is to say it was great, however I will probably stick to squeezing fresh limes into my Fernet in the future. Making a lime cordial is a pain, whereas juicing a lime isn’t, and the extra effort involved in making the cordial isn’t justified by this gimlet. Eye: White, hard to discern that lime cordial is present. Nose: Sweet fruits, and citrus. Sip: Strong grassy hogo, mellowed by the lime cordial. Finish: Rum and lime are both present, well-balanced. The Wray & Nephew gimlet was outstanding, and definitely in my top three. I love rum agricole, with its funky, grassy flavors. Wray & Nephew lacks some of the frutier notes that I’ve had in other white rums, but that is OK here, since it gets out of the way and gives the lime cordial some breathing room. Together, the two components balance each other well. Make this gimlet, you won’t be sad. The tequila gimlet was quite similar to the mezcal gimlet, as you might expect. After the success of the mezcal gimlet, I wanted to see how tequila reposado would work out, and the results were similar. Of course lime and tequila match well, but I think I enjoyed the smokier flavors present in the mezcal gimlet. 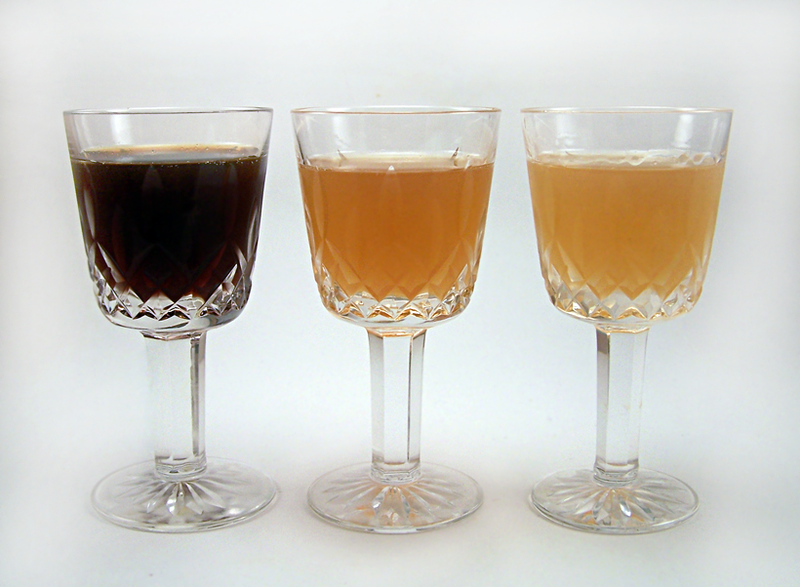 Categories: classics, spirituality | Tags: alcohol, amaro, bartending, booze, cocktail, cocktails, cordial, craft cocktails, drinking, drinks, fernet branca, gimlet, gin, libation laboratory, lime, lime cordial, liquor, mezcal, mixed drinks, reposado, rum, suze, tequila, tequila reposado, wray & nephew | Permalink. MxMo update: It looks like all of the MxMo latecomers are in, so we went ahead and updated the post with four new entries from Southern Ash, Feu-de-Vie, Chemistry of the Cocktail, and Bartending Notes. Their drinks are awesome, so be sure to check them out. We can’t wait to see you all next month. Inspired by a New York Times Magazine article describing a “raw” lime cordial, Joe and I decided to explore the spectrum of citrus cordials. We made lemon, lime, and grapefruit cordials and mixed a series of gimlets with each, using an array of base spirits selected because we thought they’d be interesting to try out. In this series, we present our tasting notes. For the first post in this series, we made lemon gimlets using Zucca, Smith & Cross, and Cognac Salignac. I’ve always made a gimlet using a 4:1 ratio of gin to lime cordial, so we used this as our starting point. However, as we quickly learned, this ratio was designed for gin, and, as always, you should use your taste as your guide when trying something new. Also, home-made cordials are going to taste sweeter and more intense than anything store-bought. For each of our gimlets we fixed the amount of cordial to .5 oz, then poured .5 oz of base spirit at a time, tasting and adjusting until the flavors were balanced well enough. Peel your citrus fruits and remove all pith from the peels. Add all ingredients to a medium-sized pot over medium heat and stir until integrated. Strain and discard the peels. Eye: Very dark, can’t see the lemon cordial at all. Sip: Bittersweet, zucca and lemon blend together well. Finish: Bittersweet, pretty much the same as it started. It’s well known that rhubarb tastes great with citrus, especially oranges and lemons. Zucca, of course, is bittersweet, and its citrus notes are amplified by the lemon cordial. A great gimlet, probably my second favorite of the three. Eye: Dark brown/yellow, an intriguing amber color. Nose: Sweet caramel with a hint of lemon. Sip: Dark caramel and fresh, funky hogo. Finish: Exotic fruits, bright citrus. Joe and I both agree that this was the winner. Smith & Cross is one of our favorite rums, and the lemon cordial makes it sing to us. It’s amazing how the fruit in the rum is amplified by the lemon cordial. It was a great match. Eye: Looks yellow, almost like pineapple juice. Nose: Cognac and lemon, predictably. Sip: Sweet, caramel, bright lemons. Finish: Weak finish from the cognac, lemon overwhelms it. The first few sips of this were great, and Joe and I were considering it for second place, but the problem was that the cognac finished weakly, and is overwhelmed by the lemon cordial in the swallow. Join us again next week, when we’ll explore the lime cordial. Categories: classics, spirituality | Tags: alcohol, amaro, bartending, booze, cocktail, cocktails, cognac, cognac salignac, cordial, craft cocktails, drinking, drinks, gimlet, lemon, lemon cordial, libation laboratory, liquor, mixed drinks, rum, Smith & Cross, zucca | Permalink.